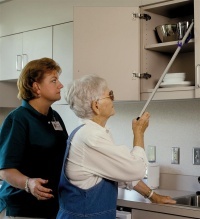 Brookline provides a broad spectrum of services to meet the needs of residents. 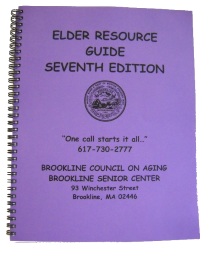 The support services available to older Brookline residents are so extensive and so far-reaching that they fill a book, quite literally. The formal title of the book is The Elder Resource Guide, but it is widely referred to as the "purple book," because of its purple cover. In this guide -- from A for Adult Health Care, to W for websites – you will find help navigating through the sometimes bewildering array of programs – local, state and federal – that are of value to older people. The seventh edition, published in May 2015, includes updates to all 65 resources in the sixth edition and new sections on Companionship/Friendly Visitors, Partners in Care: REAP ( Retirement Engagement Alternatives Program), and Pet Care. The top of this page contains links, drawn from that Guide, to websites that can provide more information on Brookline’s network of support services.